When it comes to liberating ourselves, it is important that we produce the knowledge behind the movements aimed at transforming our societies for the better. It is why I started this blog, and why I seek to make Ghaminism a thing. 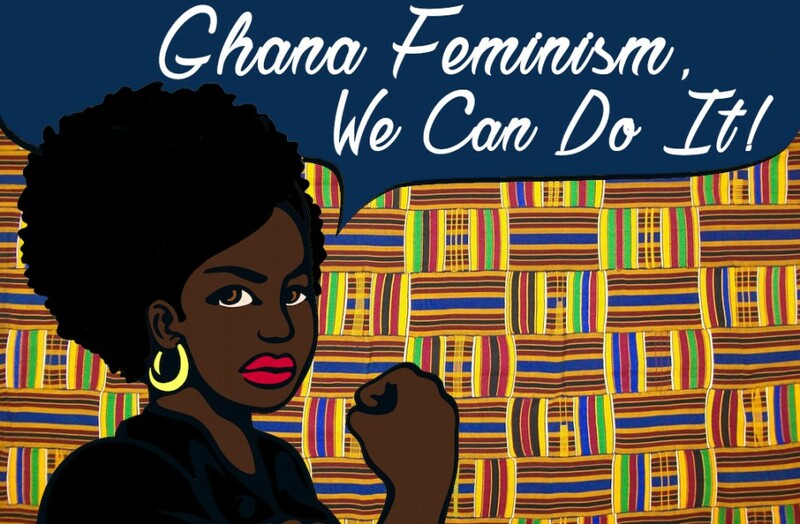 Ghanaian feminism (“Ghaminism”) is a socio-political, digital movement aimed at liberating Ghanaians from constricting gender oppression as part of a greater global movement for equity. Ghaminism is diverse and seeks to benefit all living creatures in the space of Ghana and in the world as a whole. At first there was a temptation to make Ghaminism a woman centered venture for social, economic, and political rights. While this is a noble quest, it leaves out androgynous, gender non-binary, and other marginalized gender identities that exist in Ghana. So the focus of this digital movement will make Ghaminism for everyone, with an emphasis on women, gender-non binary, androgynous, and transgender persons. Ghaminism, like the greater global feminism, will also make room for men. Ensuring that it attacks the burden that patriarchy imposes on all persons. Ghaminism is NOT an indeginized feminism. Such a conception is misleading for it presumes that feminism and its concepts originate in the “West”, and that this Western paradigm has been adopted to serve Ghanaians. The notion that all people deserve social, political, economic, sexual and cultural equity is not foreign or new to the continent. Femnism in theory and practice has always existed in what we now understand Africa to be. From the all women Dahomey military of Benin that held off the Portuguese to female powerful entities that were worshipped, notions of gender equity existed in many forms. Often in a post-colonized space, distorted, ahistorical understandings of “progress” occur, where those that theorized us as uncivilized savages are looked to as the basis for advancement. I reject wholeheartedly the above mentioned notion. I provide the following two examples to illustrate my point: that liberating gendered acts can be found in traditional Ghanaian cultural customs and progression, and the adoption of a white produced feminism in colonial and imperial countries is not necessary. First, a liberal understanding of mothering that allows women to bring their children into work spaces is often cast as a progressive evolution in the West. Yet as the tweet below demonstrates it is an idea that has existed in practice in many African spaces far before exclusionary work and “domestic” spaces were created by the industrial revolution. (Where ideal capitalistic, models of work required women to stay home, and men to go out and work for a wage in manufacturing, industrial, service etc. industries). We can see here that Ghanaian women worked and mothered without the dual separation. Second, the “progressive” notion of European and American women’s refusal to adopt their husband’s last name is a practice that pre-colonial African women did not engage in. For us, it was an unnecessary sign of resistance because European legal institutions that classified women as men’s property (first as your father’s, and then your husband’s) did not exist until European colonizers imposed their legal system. So choosing to keep the name I was born with as political resistance is not just the emulation of contemporary white women, but a resistance to both cultural imperialism ( that mandated that African women start emulating white-supremacist, misogynistic European practices) and misogyny. Ghaminism does not seek to throw away Ghanaian tradition simply because it is “tradition”. The binary created between tradition and reason is a false and problematic one. In fact all theories: whether feminism, humanism, or post-colonialism have a set of practices that historically and contemporarily structure its manifestation and praxis. I mean to say every institution has a tradition, and to simply replace Ghanaian cultural institutions with supposed “objective” theories of liberation manufactured in white dominated spaces IS neo-colonization. Because essentially, one is replacing the Ghanaian cultural traditions with Western philosophical reasoning traditions, yet FAILING to point this out. It is the devaluing of indigenous Ghanaian and African institutions and the overvaluing of supposed universal ideas, produced outside of the context of Ghana by former colonizing powers. This isn’t to say that certain theories are bad because they were conceptualized in “Western” spaces. It is to say that for past few centuries, the legacy of the “white man’s burden” still haunts us. The belief that is the duty of benevolent white saviors to rescue the savage African from his own backwards culture continues today. How then does one explain this: the white supremacist cesspool also known as United Kingdom, with its political participation in Guantanamo (where persons are forcefully rectally fed), its history of supporting apartheid South Africa, felt superior enough to instruct Ghana to comply with its human rights agenda or suffer economic loss. It is the belief that white imperial powers get to decide the human rights agenda because imperial powers have more progressive cultures. Additionally, it is the belief that white imperial powers are doing us a favor by mandating their understanding of human rights progress, despite different political climate, social environments, and cultural contexts. Ghaminism rejects the effects of the benevolent white savior complex. First, because it clearly undermines Ghana’s political sovereignty for a colonial power to determine our agenda. Second, it is an oppressive move that does not take into account the needs, desires and goals of advocates on the ground who seek the same goal yet are context knowledgeable. Thus, Ghaminism embraces the self-determinism of Ghanaians by seeking to produce liberating, gendered, ideas for a better Ghana on our own terms. Rather Ghamnism will seek to revamp, edit, and keep Ghanaian cultural institutions that seek to bring about liberation. For those who have had their history distorted, their cultural institutions destroyed, their norms theorized as “backwards”, we should not be in the habit of casually tossing aside our heritage and lineage UNLESS it is oppressive and cannot be altered in a liberating manner. It is an act of self-love and self-affirmation to realize that we too are good enough, our social constructs are worthy, our historical creations have value in a world that teaches us daily that our language is a dialect, our food is off-putting, our clothing cannot be professional, and our intellectual creations are just not up to par. I also reject the simplistic back and forth over deciding whether something is “western” or “African”. First, those two categories are not mutually exclusive, we have contributed greatly to the West and the “West” has influenced our culture. Our imaginations of ourselves as authentic when we are “exclusively African” is humorous, because the category “African” itself is a colonial categorization. While there is much need for wariness about epistemological and cultural imperialism, Ghaminism will willingly incorporate good and ethical practices from the “West” if it contributes to the liberations of Ghanaians. Who Does Ghaminism Seek To Do? Ghaminism does not seek to be just ideological, but also deeply practical. It seeks to be shape the ideologies of Ghanaian citizens who would then center gender liberation in their politics. It is for persons from all ten regions, different class backgrounds, from lawyer to kayayoo, abled to disabled, literate to illiterate, adult to child, “half-co” to koo-blackie, non-believer to ardent theist. We must meet people where they are. Ghaminism ofcourse, like many movements have limitations THe obvious limitation being that it currently presents as a deeply, academic set of theoretical foundations accessible only to those who have internet access. This means, in a country where only 6% of the population have access to tertiary education, and dismal internet access these ideas will only reach a few. 1. Great arguments to begin with. I like the way you showed pre-colonial examples of feminism and other progressive values. But you also show that you wish to “revamp, edit, and keep Ghanaian cultural institutions”, meaning you do not accept a wholesale swallowing of “culture”. 2. My main issue is Ghaminism may attract more debate than action. It would be good to spark ideological debate among the feminist intellectual community (I’m being elitist, I know). But how does that help address the issues of the women going through oppression and inequality? Especially since they are most likely not going to be able to participate in the debate? 3. Please. Please. As much as possible, let Ghaminism not create a rift between existing Ghanaian feminists and Ghaminists. 2. I think that these conversations are important. They do not seek to stunt action. Ghaminism’s framework for example would inform how we pass legislature, how we educate, how we organize,how we maintain political sovereignty and even how we get out of this humanitarian industrial complex (race for donor funds). 3. That would be a nightmare. Ghaminism does not seek to create a wedge between Ghanaian feminists but rather to create a space within Ghanaian feminists for those with this set of lens. The difference between feminism as a movement and other movements is that it is often self-critical in a way that furthers its goal. Difference has been the basis of the Feminist advancement. I also seek to be transparent and open to criticism. The feminist tradition seeks push back and critique to improve. Here in this space, it will be less about me (unlike twitter) and more about ideas and praxis. First, Im really happy this blog is up and running. Also glad that Ghaminism is presented as inclusive, show how the idea of equality is inherent and not a foreign import and also seek to center our progressive cultural values. I look forward to when it moves from digital space to active work on the ground in Ghana and would love to be a part of that. Great first article! Ayeekooo! Well done. I’m so glad this is up and running. I’m looking forward to watching this movement grow and develop, and to hearing more voices join the refrain!